You don’t really know what pain is until you try and get the words in this products title in the right order for SEO purposes, you know. 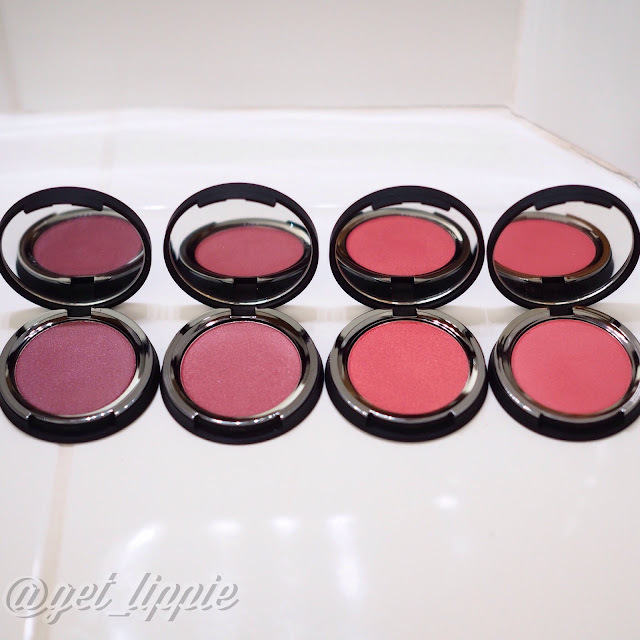 For the record these are: It Cosmetics Vitality Cheek Flush Powder Blush Stains (try saying that three times fast), which have just launched on QVC, and come in four glowing, jewel-like shades (l-r) : Magical in Mauve, Radiant in Rose, Pretty in Peony and Matte Sweet Apple. Though the product name might be a mouthful, it’s really very apt, they are definitely stains! 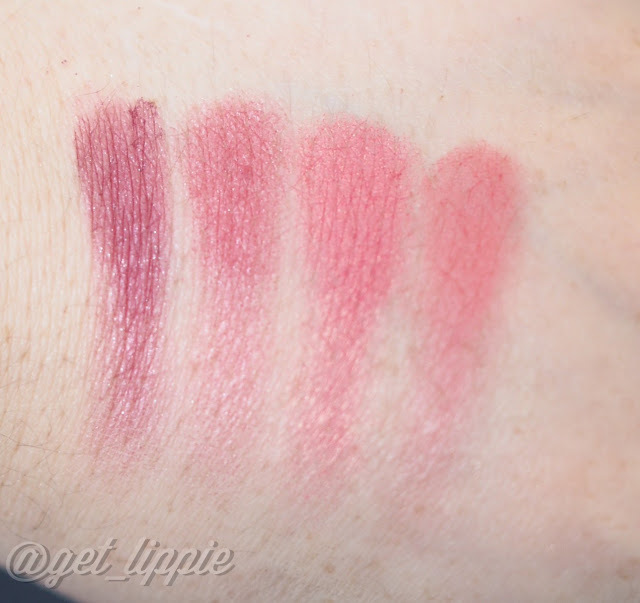 I don’t write about blushers often on Get Lippie, as they’re just not as interesting to me as lipsticks, or perfumes or skincare, but when I get a good one, I tend to love it to death. And when I say that these are getting a LOT of love chez Lippie at the moment, it would be a mild understatement. Three of these Vitality Cheek Flush Powder Blush Stains (look, I didn’t just spend an hour learning the name of the product only to not use it at every available opportunity, you know) turned up as part of a press gift, and I was so impressed I immediately went and ordered the fourth so I would have the complete set! As I’m supposedly on a bit of a no-buy at the moment – we’ve just furnished our new flat – moving house has been the reason for my recent bit of radio-silence – this just goes to show how impressive they really are! It’s quite a feat to get powder blushes which are hugely pigmented – and I do mean HUGELY pigmented, the swatches above are one pass with a fingertip, something that you simply can’t do with other powder blushes – but still appear sheer and skin-like when applied. Normally a powder blush with this sort of pigmentation would appear chalky, or just plain dusty, but this isn’t an issue here. These blushers glow like a dream once applied, even the matte one (Sweet Apple, here on the far right). They do look rather dark in the pan thanks to the insane pigment, and you really do need the very lightest of hands to apply (trust me on this, I looked like Aunt Sally the first time I tried to put one of these on! ), but they’re really the loveliest blushers (sorry, Vitality Cheek Flush Powder Blush Stains) I’ve tried in a very long time. The colour applies sheerly, but brightly, with just the tiniest amount of powder on the brush. 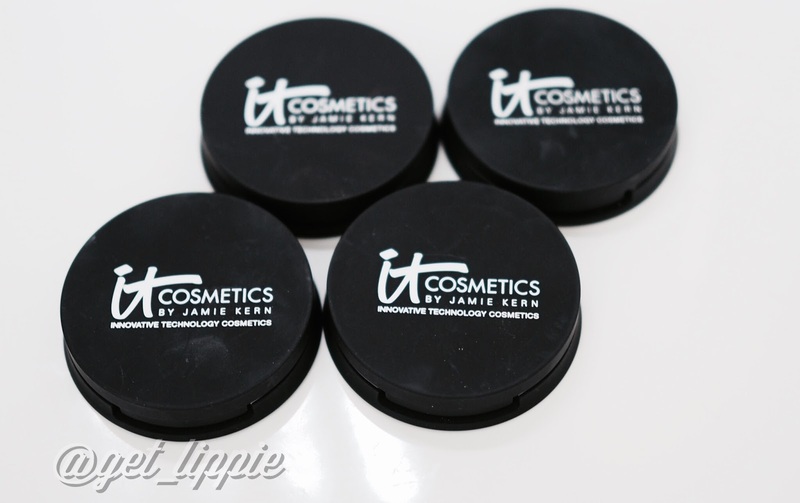 Tap lightly – once – onto the pan, do NOT swirl your brush! Seriously, you’ll regret it, if you do! Apply to the apples of your cheeks and watch it last and last and last. I swatched these on the back of my hand the first day I had them, and I still had the marks on my hands 24 hours later … During the course of a normal work-day, which for me can mean applying my makeup at 6am or so, these will last the whole day, avoiding the inevitable 3pm loo break “oh god, I look dead” realisation that is only too common as I get older. How did It Cosmetics do it? I’m not sure, but I’m glad they did, they’re marvellous. It Cosmetics Vitality Cheek Flush Powder Blush Stain (or ICVCFPBS for short) are available on QVC (not an affiliate link) for £21 each, or you can buy a set with a rather handsome brush and ICVCFPBS combined for £28.